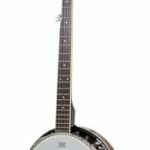 The Martin Smith BJ-003 6-String Guitar Banjo receives high marks as a guitar-tuned banjo that is easy to play. It’s a great instrument for transitioning from the guitar to the banjo without a huge learning curve. As you learn the sounds that you like from the banjo, you can move from this banjo to a 5-string, or you can tune this differently to get the sounds that you want. This is an instrument that has standard guitar tuning, so you can easily get the sweet sounds of the banjo with the strings instead of the guitar sound. Many musicians enjoy playing unique music on this instrument. This is an inexpensive 6-string banjo from a company that makes an entire line of banjos that can be tuned like guitars. The banjo is made of quality materials with a craftsmanship that rivals more expensive banjos. As a beginner to the world of banjos, this is a good compromise if you’re switching from guitar to the banjo. You’ll get the tone and sound of the banjo with a tuning that has a guitar quality. If you’re transitioning to this from a guitar, you’ll have an easier time learning. When the banjo comes from any company, it needs to be set up properly. If the company were to send you a banjo that was tightened and tuned with the bridge in place, you’d only know that because it would be in pieces. The banjo will need to be tuned, and the bridge will need to be placed under the strings when you remove it from the box. If you’re coming from a guitar, you’ll know exactly what you need to do next for tuning. For the beginner, you’ll need to learn how to tune it. There are apps that can help, but you might decide to get a professional to teach you how to tune the instrument. The Martin Smith 6-String Banjo is made with some of the best materials. The sides of the banjo as well as the back are made with mahogany that’s been covered with a high gloss. This shiny, rich wood makes the banjo stand out beautifully. The fingerboard is created with rosewood and the bridge is made of maple. These are all materials that work together to give the banjo a distinctive look. When we say the back of the banjo is made of mahogany, we’re talking about the resonator. Some banjos have an open back while others have a resonator. The sound you want and the sound produced will change depending on whether the resonator is removed or left on the banjo. If you have played a banjo before with or without the resonator, you’ll want to experiment with this banjo because it’s going to sound a bit different with guitar tuning. The coated Remo banjo head has a frosted look that is popular for most banjos. The Remo head is trusted by many major manufacturers of banjos around the world. It brings a dry sound to the instrument being played. That dry sound doesn’t come with too much sustain to it. There’s great clarity to be had with this banjo head. The 6-string banjo can be learned so quickly since it’s much like a guitar. If you’re transitioning to the banjo from guitar, you might quickly be ready for playing with a band or in front of an audience. This banjo comes with a gig carrying case that’s padded to protect the instrument. While this kind of case won’t protect the instrument from being crushed if it’s shoved in with other instruments and heavy equipment. It’ll stop the banjo from being banged around, which could cause strings to break. How much does the banjo weigh? This banjo weighs 5.7 pounds, which is a mid-weight banjo. You’ll be able to take this instrument on trips or carry it hiking to a campground where you can play for friends around a fire. Where is the banjo made? This banjo was made in China. The scale length of this banjo is 26 inches. The Martin Smith BJ003 6-String Banjo comes with a padded carrying bag. When you’re ready to take your talents on the road or on the stage, you’ll be able to place the banjo in a bag that will protect it. Even if you just want to head to the beach to play with friends around a huge bonfire, this banjo will instantly make you feel like a professional musician who can soon start playing large gigs with your banjo. Especially if you’re transitioning to a 6-string banjo from a guitar.